You need a weekend of relaxation and tranquility? Here you will find the best selection of accommodation and cottages with jacuzzi, whirlpool and indoor swimming pools for you to unwind and relax. 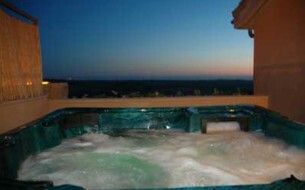 Escape a cottage with jacuzzi and surprise your partner with a romantic weekend. Let the bubbles do their effect while brindáis with a glass of cava. Bridge, apartment for six people. We have a variety of treatments to suit all tastes and needs. Apartment for two persons, double bed, individual terrace with table and chairs, bathroom with Jacuzzi and fireplace. Fully equipped kitchen, stereo, DVD and stereo.